-My good man is packing us off to Skerries for a few weeks. Whilst Joyce is primarily known for his writings about the City of Dublin, he also travelled throughout Ireland by train. Stephen Dedalus visits Cork with his father Simon in A Portrait of the Artist as a Young Man. 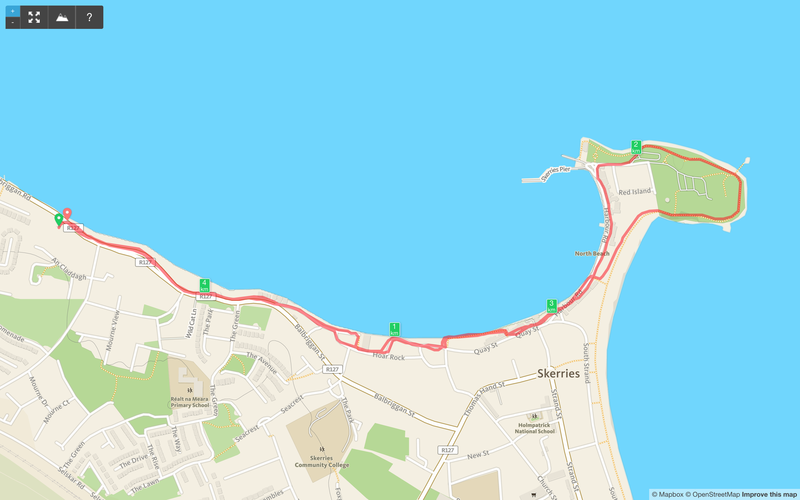 Joyce was familiar with the train line running south and north of the city and in the extract above mentions three popular seaside destinations south and north of the City, one of which is Skerries. In Flann O’Brien’s book The Dalkey Archive Skerries is the location of the narrator’s fictional meeting with James Joyce. The narrator has heard a rumour that Joyce has returned from the continent and is working in a small country pub. O’ Brien uses the passage to sum up Joyce’s work, and the significant interest in Joyce from America. -Tell me, he said. What do you want to see Joyce about? Why do you want to meet him? Quite a question, that: gratuitous, impertinent, stupid. -Anybody’s reasons for wishing to know the man should be obvious enough, Mick said coldly. In my own case, the first reason is curiosity. I believe the picture of himself he has conveyed in his writings is fallacious. I believe he must be a far better man or far worse. I think I have read all his works, though I admit I did not properly persevere with his play-writing. I consider his poetry meretricious and mannered. But I have an admiration for all his other work, for his dexterity and resource in handling language, for his precision, for his subtlety in covering the image of Dublin and her people. for his accuracy in setting down speech authentically, and for his enormous humour. As a spontaneous appraisal of literary work. this unpremeditated pronouncement was not bad at all, Mick thought. But after all, was he not a well-read man for his age and upbringing, and fearless enough in facing books in which may lurk danger to morals? He was. Dr. Crewett put down his glass. Mick allowed goodwill to return to his face. -You might remember that this Colza is not exactly a literary salon. Such matters do not properly arise here as a subject of converse. -I’ve read some of the stupid books written about Joyce and his work, mostly by Americans. A real book about Joyce, springing from many long talks with him, could clear up misunderstandings and mistakes, and eliminate a lot of stupidity. -Lord, don’t tell me that you are also an author and exegetist in your own right? -No, I don’t claim to be that at all but if I could gather together the material, a friend of mine would be able to turn it into a fine, fresh book. I happen to know somebody who can write very well. Stylishly. -My point is that such a development could take place without disclosing to the public Joyce’s present abode. -I quite see that, but perhaps Joyce wouldn’t be so convinced of the prudence of such a publication, with its implication that the master is not dead at all. Mick finished his drink abruptly. -I think we’ve had enough of this skirmishing, Dr. Crewett. Where is James Joyce living at the present time? The rest of the party, that first Bloomsday, was made up of the poet Patrick Kavanagh, the young critic Anthony Cronin, a dentist named Tom Joyce, who as Joyce’s cousin represented the family interest, and John Ryan, the painter and businessman who owned and edited the literary magazine Envoy. The idea of the Bloomsday celebration had been Ryan’s grwowing naturally out of a special Joyce issue of his magazine for which O’Nolan had been guest editor. One of the party, Anthony Cronin wrote his own biography of Flann O’Brien, No Laughing Matter, The Life and Times of Flann O’Brien, and quotes a funny passage from John Ryan’s book Remembering How We Stood describing an event that day involving Myles na Gopaleen, another of Brian O’Nolan’s pen names, in a pub in Blackrock. Perhaps it was the sound of our horses and carriages without, or just the somber appearance of Myles (for he was wearing one of those black homburg hats he dubbed ‘County Manager’), or merely the fact that he usually had funeral parties at about this time, that caused the landlord to approach us. He took Myles’ hand to offer condolence. ‘Nobody too close, I trust?’ he queried hopefully. ‘Just a friend,’ replied Myles quietly ‘fellow by the name of Joyce – James Joyce…’ meanwhile ordering another hurler of malt. Joyce fictionalised and remembered, with characters, real, imagined and embellished, living on in Dublin. Costello, P. and Van De Kamp, P. (1989) Flann O’Brien: An Illustrated Biography. London, United Kingdom: Bloomsbury Publishing PLC. Cronin, A. (1989) No Laughing Matter: The Life and Times of Flann O’Brien. London, United Kingdom: Grafton. O’Brien, F. (1986) The Dalkey Archive. London, United Kingdom: Grafton.